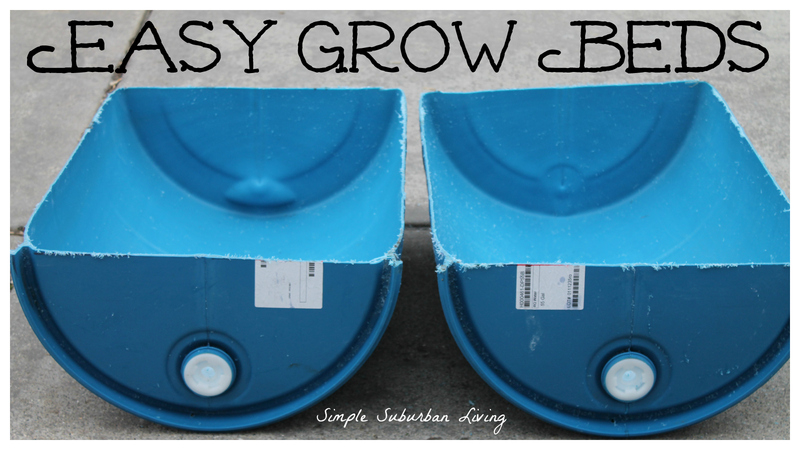 Every aquaponics or hydroponics setup needs to start with a good set of grow beds. But, what should you choose? Cement mixing trays, PVC pipe, gutters, pond liner with wood boxes, troughs, feeders, waterers; there are so many options! The best option in my opinion, for an aquaponics system especially, is these 55 gallon plastic barrels. They are cheap, durable, food safe, and generally come with food products in them so they are easy to prep. Below is a method that I have developed to get these cut perfectly in half and ready for your setup. I have used both the white and the blue 55 gallon drums but I prefer the blue ones. These generally come with food materials in them and are easiest to clean. In my first system I used the white ones and they had some type of cleaner in them. A quick trip to the power washer took care of it but I was always unsure if I had removed it all well enough. I have had the best luck on Craigslist finding these and pay between $10-$20 depending on how far I want to drive to get them. There are a couple of different types of plastic that you should be aware of when working with anything you are growing food in. Some grades and types of plastic are safe while some are not. HDPE, Vinyl, LDPE, PP, and PS are some of the labels that you will see, most commonly HDPE, which is High Density Polyethylene. All of these listed here are considered food grade or food safe plastics. I have also seen the label above "PE-HD" with the same recycling symbol (2). I can't say why it is labeled differently but it is also supposed to be High Density Polyethylene and food safe. Now down to the fun part, cutting stuff! For a perfect grow bed you need two perfect halves. There are two methods to accomplish this. the first is to just follow the seem with a circular saw and cut the barrel in half. The only problem with that method is that the seam goes right through the bung on each side of the top lid rendering them useless. This is fine if you do not plan to use them and I have actually done this for some of mine. However, the best way is to leave them intact. So how do you cut a cylinder perfectly in half? Well, the easiest way is to first make yourself a larger square. I screwed these two pieces of 2X4 together at a perfect 90 degree angle to use here. You could also use a large carpenters square. Start by measuring out and marking the center point on the top of the barrel lid. Then use a square to draw a perpendicular line across the top of the barrel. This will give you your references to draw down the sides. Now, use your large square placed on the lid to match up to the line on the top and transfer it down the side of the barrel on each side. You can then transfer the line onto the bottom on each side and connect the two together. You now have a perfectly straight line to follow with your saw. You can cut these anyway that you would like but I have found a circular saw to be the easiest. You could also use a reciprocating saw, saber saw, jig saw, hand saw, router, dremel, angle grinder, etc. What you end up with is two perfectly neat and equal halves with the threaded bungs intact and centered at the bottom of each barrel. These are very useful for connecting barrels together, external bell siphons, water supply piping and other things I am sure I have not thought of yet. I will talk more about installing these and building a frame for them in a later post and video, until then, thanks for stopping by!